Ask anyone who has jumped out of a plane about ground rush. The effect can be unsettling, and for some, the end isn’t good. The DV lottery is a lot like that in some years. This will be one of those years – at least for some. Yesterday the VB for July interviews was published. Some were surprised about the AF jump (although that should not have been a surprise to those paying attention), AS region reached a high number (although I was surprised it’s didn’t go current). EU region had a horrible month (another horrible month). OC and SA are behaving in an utterly predictable way. Well, the end of the DV lottery year in over selected years (like DV2018) is always a bit unpredictable. Several times this year I have cautioned people to look back to DV2015 and what happened to AF region in particular. Over the past couple of years the lottery was underselected, so the outcome was easy to predict. So – this year, as the year gets late, people are surprised to read “wait and see” all the time, but in reality that is “normal” for over selected years. In reality, KCC and the visa office are having to juggle a lot of balls in the air. This year has been harder than most because of new security measures, the travel ban and so on. There are many people waiting for the supreme court decision, but time is running out for those people. However, it must be a factor for KCC/VO. Something, (probably the newish DS5535) is slowing up embassy work. At some embassies ( Cameroon and Cote d’Ivoire for instance), there are many people expecting June interviews that have not been scheduled and will now be given July interviews. Now with the big jump yesterday, that gives some concern. We can see issued numbers and progress at Xarthisius’ site – thanks to him and the people that continue to help with scraping. Now, for those that read my update about quotas, they will have seen my discussing the quotas, and the possibility for a region to exceed the quotas (either by redistribution or by using Nacara allocation). I am NOT saying that WILL happen – just that it can happen. AS region is massively affected by the travel ban. If the ban is not lifted Iranian and Yemeni selectees have little or no chance of getting their visas. Because of security delays, trhat might already be the case anyway – even if the ban were lifted today. So – AS region will most likely not meet the quota. Those visas could be redistributed – if they know early enough. I think that is quite likely – but I was actually expecting AS to be current yesterday to enable that decision. So, redistribution from AS could help other regions. AF region might also underfill. In fact – DV2015 is an example of that. In that year, AF region was underfilled (somewhat deliberately) and EU region benefitted. In fact, in DV2015 there were AF numbers up to 90,000. They cutoff the region at 50,000 and left AF under quota. The reasoning can only be that AF could not meet it’s quota because of embassy capacity and processing delays, so in that case, EU was able to continue taking visas above it’s quota. So – if KCC/VO decided that should happen again – what would they have to do. Well first they would have to give AF region the best chance possible. AF region has been slow to use it’s visas, many no shows, refusals, and delays. To try and get the region to take as many visas as possible, they would have a big jump and try and schedule as many interviews as possible (they did that yesterday). The quieter embassies would be able to handle some more cases, other embassies might not. In some cases we would see appointments being pushed to later months (we are already seeing that and I suspect we will see more soon). So – the conditions for a redistribution from AF are being created. AF is entitled to as many visas as it can use within the quota, but if the visas cannot be used, it is better to plan to redistribute some to other regions. Now – EU region would be the largest beneficiary of any such redistribution. Early processing has gone very fast, issued numbers are high. If the quota is strictly enforced (and it might be), there are only about 5000 visas left and EU is issuing about 2000 per month. So – the slow down of VB pace for EU “seems” to suggest they are shooting for the basic quota. They would try and reduce the pace of issuance to make the visas last until September. That is what yesterday was about. If there were a redistribution there could be a small benefit to OC and SA region also. SA was a beneficiary of that type of redistribution in DV2017. Best of luck to all waiting. I was in your position and I was in an over selected year. I “get” the frustration and fear. However, at this point we cannot be certain that they are, or are not, planning to exceed the quota. And THAT is why “wait and see” is the only sensible answer. For those of you that think I have some “inside information” and really know what is about to happen – I don’t. And to be clear, none of you do either. We can predict, and you might be right, but none of us really know. Just a quick note – next week we will see a flood of newbies for DV-2019. Not having to answer “wait and see” 100 times a day would free up some of my time! Remember to include your year when giving your case number. If EU give this visssas the high number can give the interview? even though 5000 vissas will remain? But, I agree with you that this is disappointing. What do you think about that brit ? Is it disappointing, or that means nothing ? It is on course for what I expected. 1480 issued since the 4/28 update. So we don’t know yet if we’ll have extra quota or not. If we have extra, will it be inevitably in the next VB, or it can be only in the last one ? I guess you already answered to this, but I try not to come every day. I don’t know. The next VB might be an indication, but we won’t really be sure until we see the final VB (6 to 7 weeks from now). You are right, my fault, but still disappointing considering they slowed down the numbers in Europe invited for interview. Brit, I think it really doesn’t matter if they theoretically make Europe current in last bulletin, the quota would allow a few ppl to actually get an interview. Without increase in quota, not much to be expected in Europe for higher numbers unfortunately. Europe: From March 26 to April 28th they issued 2351 visas. Then from April 28th to May 29th: 1717 visas issued. That’s a significant reduction (27% less visas issued). Considering June and July had even less cases made current than May, there should be an even greater reduction, so making some reasonable projections that means that at the end of July there will be around 15,300 visas issued. Around 3,000 left to hit the official quota… which means they should considerably raise the last VBs to make enough ready cases to at least accomplish that. I factored all that in to my previous reply to you. It was low end, but not a complete month. Yep – but the real help would be more visas. Like you I pray that Brit’s prediction are a bit off but I think we can simply hope that only the low ends of his predictions are the ones which will occur…. What is your number Dragon ? It was a complete month (April 28th-May 29th), and compared to the exact period from the previous month (March 26th-April 28th). So, I think that the comparison stands in terms of the percentage drop-off. Considering May had similar 2nls sent as April, and June and July have less 2nls sent… that’s why I think June and July should have quite a few less visas assigned than those projected by Brit in his post. That’s because there are less and less backlog cases that will likely show-up for interviews at this point. Still, no doubt the real “hope-lifting” would be… MORE VISAS PLEASE!!! Especially because there is no way they can run out of them at this point (in global terms). I don’t know for sure. Wait and see. It can take some weeks. I looked at data on xarthisius site (DV2018 CEAC Data for Embassies), and Moscow and Ankara after 21000 have no ready cases for EU region. Does this mean something or is it just coincidence? No It does not mean anything. They update CEAC data later. Last month it was like that. Next CEAC data file you can see READY cases for ankara. One of my friend has CN 215XX. What do you think of the chart? Up to 30,000 looks the same as last year. visa numbers, visa ranges etc. After 30,000, could it be chosen as a substitute for not making a new lottery? Do you think the ban on travel in Asia and the low number of visas in Africa would have a positive effect on Europe? The other chart shows that Europe has always passed over 19,000 visas in the non-current years. Could this situation be waited in this year? if 20500 or 21000 visas are allocated to europe from other regions, we can see over 30000s. yes i know wait and see but it is important for many people to share your thoughts. “There are many people waiting for the supreme court decision, but time is running out for those people.” What do you mean. They will lose their chance. If I understand the people who are In AP by filling the Ds 5535 have probably no chance to be issued? 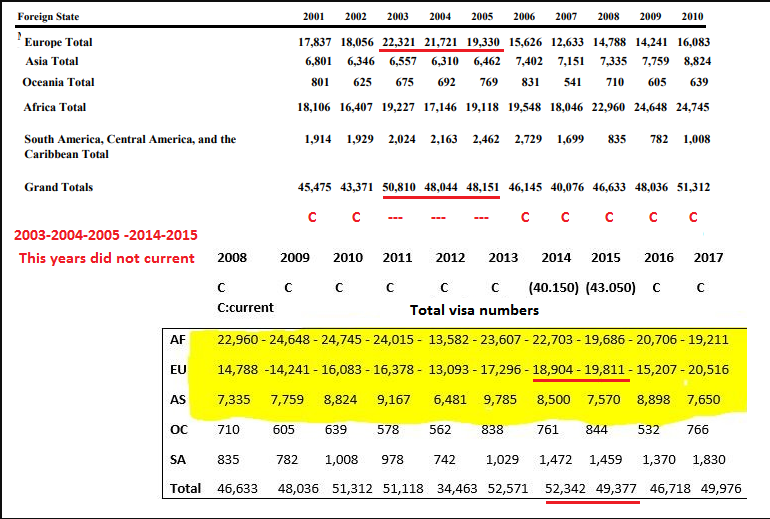 So far there was ~13500 visas issued in EU, but what is the case number for these visas, is this up until 20300 or what? No, 18050. 20300 will be after all interviews in june. No – 18049 is the highest number that could have been interviewed in May. And May hasn’t finished yet. Normally, What is the approximate percentage of AP cases that are successfully resolved at the end. 90%? 80% just an approximate number from your experience. I have a query relating to the address in usa. My interview is likely to be scheduled on Septemb. While filling the DS 260 form, I had entered the address of one of my relatives. However, they are shifting from that address now. So, do I have to change the adress by unlocking it from NYC and if I have to do that, will it delay my 2nd letter? Change the address at the interview. At the time of interview? Can I do that? And do they reject on such grounds? If I unlock the form and change the address now, will it delay my 2nd letter? Thanks for your guide. KCC dropped real case numbers this month in order to reach quota (18300) as you mentioned. However, Africa is not better than last year and Asia has banned countries. So, my question is target is 50K or 18300 ? 50k is the global quota. 18300 is the EU portion of that quota. i think what he means is: will they go for 50k issued in total, or just the basic quota in eu of 18300 visas.. I don’t know what is going to happen. Judging from previous years data, it seems that they try to get the quota as close to the 50,000 number as they can (sometimes they can’t cause they under-selected). I think they also try to give each region its assigned quota but when they realize they can’t do that in some region they redistribute to other regions that can “absorb” the left-over visas. Judging from the great article on quotas, this is what has ALWAYS happened before. Of course, this year could be the exception…. Africa will probably go current but fall way short of their 21,500 visas (probably 2,500 short). Asia, even if the travel ban is lifted (quite unlikely) will fall short as well (at least 1,500 short if not more). That means that if they don’t redistribute and give EU “only” its allotted 18,300 there will be more than 4,000 visas go to waste, which would be quite a shame in such an over-selected year… that is if their goal is to try to get as close to the 50,000 mark, which I think it is. Still, I don’t believe EU will get 4,000 extra quota, basically because I don’t think embassy capacity could make that feasible in the remaining two months left. 21,000 is probably the limit, and that will still leave around 1500 visas left unused by the end of the process. No way AF will go “Current”,…not because of quota but because the slow pace of interview scheduling probably due to Capacity issues of some COs and extra-screening of “Candor” candidates. Remember, most July’s current cases in AF haven’t received their 2NL. I too thought this was going to be the case (AF going current, in August or September), but after the last 2NL data,…I have serious doubt. I suspect there will be another big jump for august (but not as big as July’s),…and that’s it. In the best of case the cut-off number will be 46XXX. You may be lucky in EU, since thousands of AF visas will be “unfillable” and may be redistributed to EU for September. @saabe I agree that a lof of cases in AF won’t be interviewed even in AF goes current, but I was thinking that certain embassies with few selectees could manage it, and by going “current” they at least give those selectees a chance and fill some otherwise hard to assign visas. I think that’s the reason behind the “Big Jump” of the last VB. They would rather stop the evolution and impose a cut-off number at an early stage, before not scheduling current cases. Besides there are clues that the real issue for some AF consulates (casablanca for example) is not capacity per se,…but additional background-checks, I suspect carried out by the consular services before scheduling a an appointment,…maybe because they know they no longer have time for AP, so they do it automatically before meeting the candidate. I hope I’m wrong, but right now I doubt AF will go current. Whatever the outcome, EU will be benefited. There is no additional step before the interview – some people don’t even show up – so why do that? We have no evidence of any such change. BUT there is the DS5535 new procedure which would affect the workload of the embassy. When I talk about “capacity” it is not simply the number of people they can see in a day, but the processing time per case. @saabe I’m not so sure EU will be benefited… I think it’s been obvious for a while that AF and AS won’t meet their quota and still EU’s VB numbers have been kept extremely low in order to hit the “normal” quota. We’ll see if that changes in the next VB, but for now, I’m keeping my epxectations in check. I wish you the best of luck! Let’s keep our fingers crossed and hope for a positive outcome! I take it that you mean 1000-1500 left for August and September together, not each, is that right? Also, does that 1000-1500 include or exclude the 400/500 cases that will go to AOS? So would that mean approximately 1500-2000 left including AOS? I’m doing AOS, and there are approximately 2100 cases in between July cutoff and my case number (I’m a little short of 24K EU), and I’m trying to make a decision as to whether I should go ahead and do the medicals after the visa bulletin this month, but I’m having difficulty making a decision. I still can’t tell with 2 VBs left, and about 2100 cases in between , whether my number is slightly risky or very risky, or not risky at all, for an interview. Yes, I meant 1000 to 1500 for the last two months together. The quota at 50k is 18300. We are at 13734. June and July will take AT LEAST 2500, probably more. So call it 16500 by the end of July. AOS should take at least 250/300 of the 18300 – so 18000 is the target if we don’t see more quota. So – that explains my 1000 to 1500 statement. Now, you should consider a difference between AOS and CP. When the VB is published, the visa office have taken into consideration the remaining cases and **pre-allocate** a visa for each CP selectee plus derivatives. That means that a CP case scheduled for the 30th September can be approved, because the visas are reserved. Cases that don’t have a reserved visa per selectee are 1. Clearing AP cases from previous months. 2. Rescheduled cases from previous months 3. AOS cases. So – you might find your number gets current for September, you start your AOS process in July (using early filing) BUT visas are exhausted before the month is over. You would only find out at the end of your AOS interview when the IO checks their system to allocate a visa. So – as some cases found out in DV2017, AOS cases get stuck without a visa – and there is nothing that can be done. For that reason, you might want to consider switching to CP – BUT doing so carries some risk in that you would file a DS260 thus declaring immigrant intent. That can make FUTURE non immigrant visas harder to get approved. Is there anyone who in the last few years (or perhaps more specifically in the similar year DV2015) got and interview after a late submission (May a year after the results come out and 4 months before the 30th of September)? Any data or idea on that? Brit If you see in grafik ,there are 23000 ready for Eu …I don’t understand ,what this mean? Because for Eu nr is 22000…Can you explain please ? It is just the way the visualization works. Not reality. can go current, your opinion? Hello brit probably this one was asked millions of times but considering those ongoing things, Does the number 2018EU258*** have a chance for interview? If the quota for EU = 18300 and currently we have Issued (13734) + AP (1115) + Ready (4206) = 19055, then it turns out that the limit has already been exceeded for July? Not all ready will turn to issued. I have One question, In my interview the adress that i did in the Ds260 was different to the adress of my sponsor. I had Already my interview and put on AP by filling the Ds5535. Do you think that had influenced my case to have two adress different? Nothing to do with the addresses. that does not cause a problem I hope? All the analysis we could do doesn’t provide certainty. In a few days we will see the penultimate VB. Wait. Then you will see…. If we do see a redistribution from AS region, we would see a couple of things. AS region going current this next VB (I think that is likely). SA region seeing an increase of > 200 in the next VB (EU and OC would also see small, but unexpected jumps). Now – wait and see. If AS region were to be CURRENT it would mean EVERY case could be scheduled – no number limit at all. small but unexpected jumps? What does that mean brit? Hi Simon I entered USA two weeks ago through lottery and am currently in Florida can I travel by air to Texas even though green card and SSN has not been delivered? Hi…Do I need to take my 3 year and 8 year old to the interview? Me and my wife to attend is sufficient? Appreciate your time. Thank you. The children attend the interview unless the embassy instructs otherwise. hi briti i los my pasport i change emergntly at immigration at that time the first pasport no is chenged from previous no an the visa is come with the previous no is there problem with this case? I have no idea because you were unclear. I guess he is saying that he lost his passport and got a new so the previous number he entered to DS-260 was changed. We have similar issue actually. My wife (The primary winner of the lottery) has renewed her old passport because it was about the expire. So she has a new passport number. So do we have to open DS-260 to renew the passport number otherwise can we get denied at interview. Our number is not current by the way, it is EU23xxx. Renewing a passport doesn’t mean denial. It’s best to update the DS260 – but also it is safe to simply take old and new passports to the interview. This is the same as every month. The VB is released between the 8th and the 15th. Really, I hope will be in that way . Full stress right now! If you noticed, VB for May was published on 12-April which is Thursday, VB for June was published on 10-May which is Thursday as well. Might be a coincidence. Simon will say that is nothing to do with it, by maybe it looks like tomorrow will be the day for releasing the new VB. Yeah you are right about what I will say. The VB has been published on many days. There are only 5 days of the week – so some coincidences are inevitable. Obviously tomorrow could be another coincidence, but it would not mean the theory is correct. No redistribution at all, just going to barely hit the basic quota. There are 651 real cases between the number 21900 and 23325, the same number of real cases that were between 20300 and 21900 so they are going for roughly 800 additional visas for August. This is completely out of any prediction that we were talking all this time taking into consideration visa redistribution. Very sad for EU high numbers including me. Actually – I am looking at OC and SA as evidence that there has been a redistribution – which would have affected EU also – but yes – the number still is very low. SA 1585 :/, I hope next VB (CURRENT OR > 200 ). This a nightmare..
DV18 is over for Europe! yeap, yes, only the link has been activated. As I understood from previous comments of Brit, redistribution is going to be seen on next VB. Yeah! Brit predicted that ( If AS region going current this next VB (I think that is likely). 1.- The number no change – Sad for us. I need only 180 number for SA. Note: for me, i hope will be current because I lot of people did not send the ds-260, why?, because this year the pace was very slow and now, only the people who sent the DS 260 on time can have a chance to interview if go current. Now, Wait and See to the next VB. Only CURRENT can save me O.o. A lot swim for die in the shore. Sad. What happens now with my number 38k . I have any opportunity to win . Or we out of quota already? Do you think a year/region might help? Now that the august cut off is out for the DV2018 EU, what do you think that will happen on september? At what number it will be the cutoff? Do you think is any change to be scheduled for the interview with a EU24*** ? Really – wait and see. Thanks, that is the only thing that I can do 🙂 but what’s your thought on the number how do you think the september VB will be? By the way, great site, great work, great informations, keep up the good work. You can and should be filing now. There is enough time if you get on with it. I agree with your lawyer. For AOS, the last step after the interview is to check if a visa is available for you. I’m guessing the system will not release a visa slot for you because you will not be current. Hi, my mom got selected in the 2019 draw, she is 55 years old and she doesen’t qualify by education she may by experience which is tough to prove because her experience straddles between zone 3 and zone 4 depending on title, how can I make her case strong if I go ahead with this application? Does age matter considering she is also a decade away from retirement? Her number is below AF3000 so I am assuming she may be called in soon? First thing. Can she afford to risk the medical and interview fees? With what you are saying about her work experience, there is a risk of denial. She needs to be brutally honest with herself about whether she is really a zone 4. Second. Because of her age she does not have much time to settle, and start building a life. Does she have plenty of money already? If not, she should think long and hard about making such a big move at a time when she should be planning for retirement. Many over 50’s find it harder to get a job, so is she really a person that is prepared to go through struggles for the sake of this opportunity? After a painful 16 months, with a number 2018EU23xxx I finally had my interview last week and got my DV a few days ago. I would like to THANK YOU a lot for your all realistic advice and explanations as well as help. I really admire that you did not sell hope to people. Many time people including me would like to hear what they expect to see. Any way tanks for your helps and patience again. For those who got their visas too, congratulations guys and best luck in your new life in the states. For those who could not make it this year, do not worry and do not give up. Life is full of good suprise.